Special 7-5 is the fifth level of Special 7 in Super Mario 3D Land. It is based off of World 7-Airship. 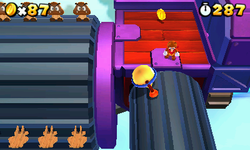 The player starts on an Airship with a rotating gear platform with several Goomba Boards on it, at the end of the rotating gear platform is a small platform that leads to another Airship, that has three ? Blocks on it, the block on the right has a Coin, the middle one has a Fire Flower and the one on the left contains a Poison Mushroom. After this, there are some more rotating gear platforms that lead to an Airship with a Warp Box on it. The Warp Box leads to an Airship with a Toad, who will give the player a 1-Up Mushroom, and the Goal Pole on it. Star Medal 1: Floating above a Flying ? Block. Star Medal 2: On a red rotating gear next to where a Magikoopa spawns. Star Medal 3: On the Airship with the + Clocks, the player needs to go to the side of it before climbing it. The Star Medal is on a rotating gear at the top.